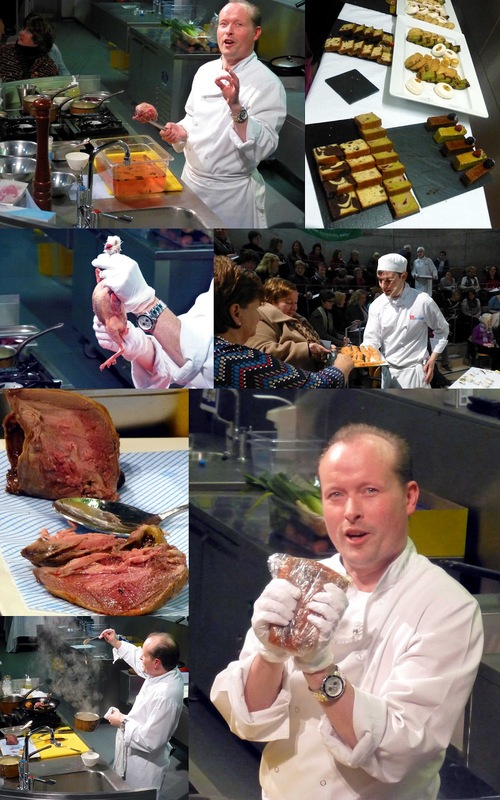 In May, Electric chef Kevin O'Regan was dishing out gorgeous slices of freshly cut Iberico (top left pic), the top ham of Spain, perhaps of the world at the Murphy's Food Event in South Main Street. And then he took to the stage and delivered a delightful demonstration of how best to cook the humble pig’s trotter, perhaps better known as the crubeen. In July, he was busy on the Electric stand at the Cork Food Fest in the Mardyke. By November, Kevin had made the big move to the newly upgraded Chapel Steps in Bandon. It was a miserable November evening when I walked it but the place was busy, a great ambience and great food on the table. 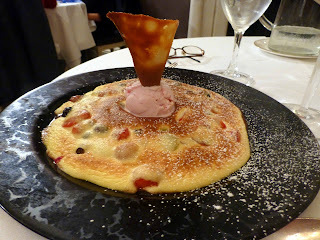 The account of that meal went on to accumulate over two thousand hits and was my most popular post of 2012. In a glass of buttermilk! Colm McCan of Ballymaloe has been in touch with great news for local wine lovers. "Château Lynch-Bages, needs no introduction in Ireland – one of the best known, respected, collected and followed, of the ‘Irish Wine Geese’ Château of Bordeaux. We are delighted to be welcoming Jean Charles to Ballymaloe – and as part of The Gathering 2013, there will also be a series of other wine events, which are being planned for Cork City and County, throughout the year, with ‘Irish Wine Geese’ winemakers from all over the wine world, ‘flying home’. Born in Bordeaux, Jean-Charles Cazes grew up in Pauillac in the heart of the family vineyards at Château Lynch Bages, and since 2006, taking over from his father, Jean-Michel Cazes, he has been in charge of all the family vineyards, in France and abroad. Join Jean Charles at Ballymaloe, for one, or both, of the following events – a wine tasting & presentation in the Grain Store at Ballymaloe, followed by a wine dinner, with the wines of Château Lynch Bages and The Cazes Family Collection wines"
Special rates available for accommodation. Always a bit suspicious when I see the blurbs on American products. 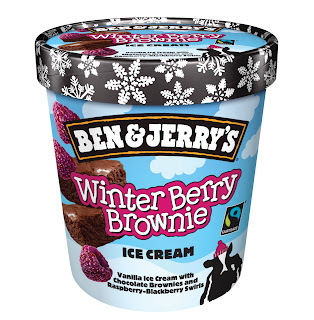 “While the weather outside is frightful, Ben & Jerry’s Winter Berry Brownie tastes delightful” was spotted on Ben & Jerry’s latest ice cream creation. 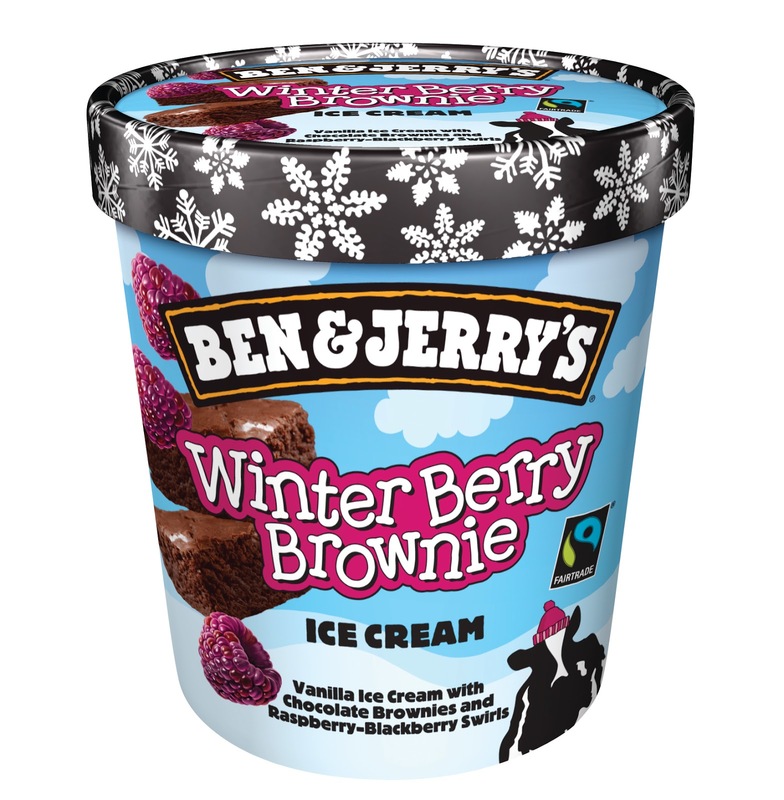 “With fluffy fudge brownies and scrumptious raspberry-blackberry swirls that melt into Fairtrade vanilla ice cream. Flavour fans can cosy up on the couch while they sleigh their way through the indulgent flavours.” Must say though that the ice-cream, especially the Brownie bits, hits the spot. Very enjoyable indeed, delightful even. In an event to brighten up the winter days after Christmas and New Year, the spirit of Rabbie Burns kindles a flame in Skibbereen! 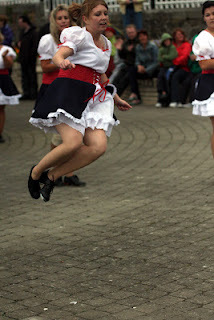 The 2013 event will work on the same basis with the addition of a Scottish Ceilidh duo, which will perform and guide novice Scottish dancers in the famous Ceilidh dances, hopefully with the support of the attending Scots guests! Not only did last year’s event celebrate Scotland and Robert Burns, it celebrated West Cork produce with a West Cork/Scottish fusion theme! For details of next year’s Burns Supper please bookmark: www.westcorkhotel.com and www.westcorkfood.com. Bookings are already being taken by the Hotel at €40 per head and around one third of the tickets have sold in the first couple of weeks. Sat. Dec. 22nd 9am. - 1 pm. Sat. Jan. 12th 9am - 1 pm. The Market will be closed for 2 weeks for Christmas. Cornelius Traas ‏@theapplefarmer tells me that Cahir Farmers Market is open today 4-8 pm for a Christmas special, and also Saturday 9-1. Tipp Green Business ‏@tpgbn have been in touch to say that the Christmas Market at St. Joseph's CBS, Nenagh, will be held on 23 Dec-proceeds go to Children's Hospital Crumlin & North Tipperary Hospice. Food Fight: Derry Clarke v Clodagh McKenna! Food Fight takes the ever popular food/restaurant format and adds a competitive edge to the proceedings, by pitting two celebrity chefs against one another. A one-off special, where two well-known chefs, Derry Clarke and Clodagh McKenna, are given the task of designing the ultimate Christmas themed restaurant. They are transported to a small Irish town location where two similarly sized eating establishments have agreed to allow them to take over for four days. With Food Fight, viewers will watch Derry Clarke and Clodagh McKenna go to Gorey, where they will each take over a restaurant. Each Chef will have just TWO days to revamp their restaurant, meet their staff, devise and cook menus which will ultimately win over the locals when they open for business ready or not, and over the next two nights try to win over the locals. 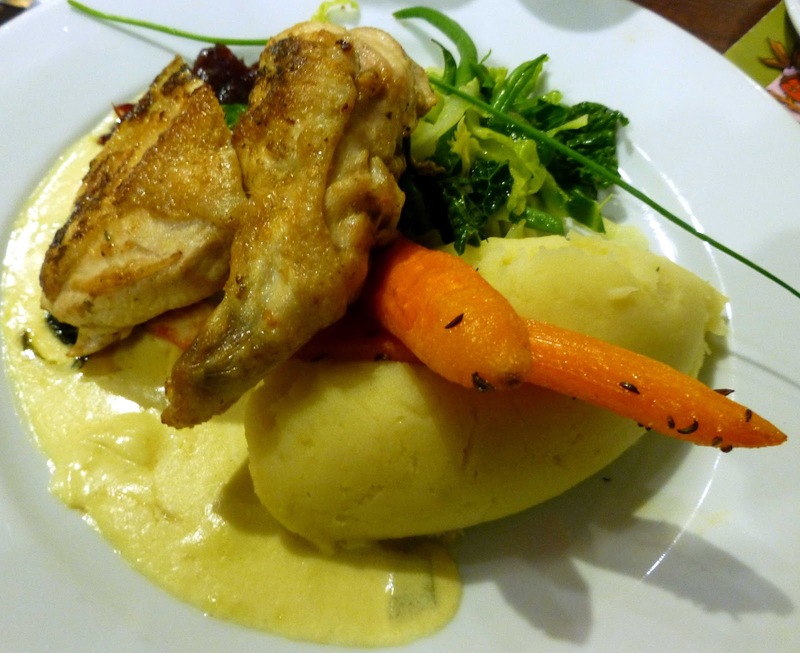 The locals will judge both of the newly run establishments with their wallets, as the diners will compare and criticize both venues etc and leave comment cards telling the chefs what they really thought of their night out. 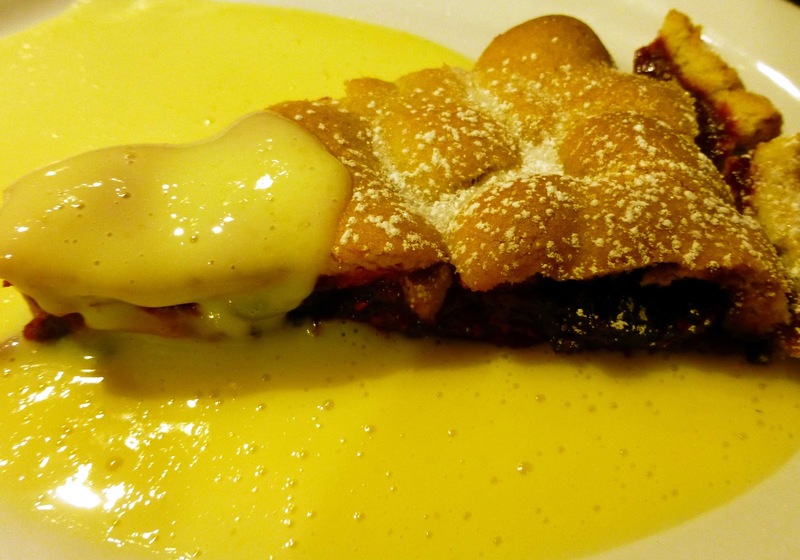 Derry and Clodagh’s task to create the ultimate Christmas eating experience. Working to the same budget they must revamp, and restyle their establishment, as well as design a menu, source and cook the food for the two nights they are open. Each Chef must train their staff and bring both the kitchen staff and the front of house staff up to speed on their ways. Finally, they must each advertise their restaurant to get to ensure they get full houses and maximum profits. Tim Vaughan, cheque in hand, announces €10000 donation. 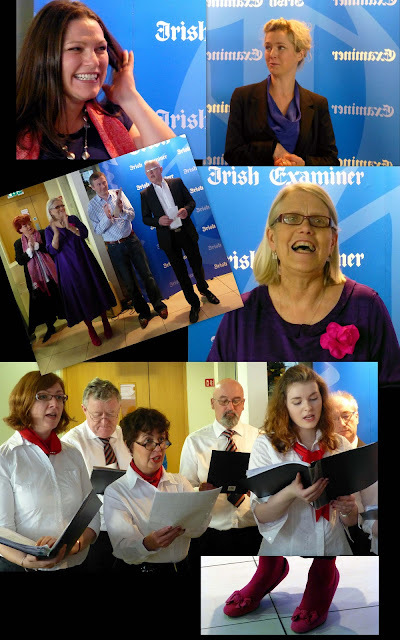 Irish Examiner editor Tim Vaughan admitted he wasn’t too happy with his public speaking role at the start of yesterday's festive coffee morning at the paper’s HQ. But he had no bother in rushing back to centre stage halfway through to announce that he had just been handed a €10,000 donation for St Vincent de Paul. That really was the icing on the cake (forgive the pun) on a very enjoyable morning. And yes there was no shortage of cake. The reception area had been magically transformed into a “cafe” by Mary Terry and her crew and we were all enjoying a drink and a cake as the UCC Choir got the morning, arranged in aid of St Vincent de Paul, off on the right note. The Examiner’s Michelle Darmody and Darina Allen were the cake experts to speak and they freely gave some terrific advice on Christmas cooking in general and on cakes in particular. Darina also sounded a serious note, reminding us to think of the charities after Christmas as well. The main event though was the announcement of the Irish Examiner Christmas Cake competition. Finally, the tension was broken for the 12 finalists when Cobh's Catriona Anderson was named as the overall winner. So well done to Catriona and to the other brave contestants, to the Examiner staff who put on a great show (and organised many prizes for the raffle) and to that anonymous donor! Happy Christmas everyone. In the morning when we rise..
Yellow (Gelber) is also the colour of this gorgeous aromatic Austria wine, the grapes for which are hard won from very steep slopes (up to 78%). The soil is a red slate in this vineyard which has been referred to, for centuries, as the best in Styria. The Muskateller is an ancient variety and the fruit is harvested very late and is handpicked. It is more light gold than yellow and you’ll see hints of green. The aromas are quite fragrant. It has a gorgeous mouthfeel, no shortage of fruit. Indeed it is excellent from the intro to the long dry finish. Quite a gem by one of the area’s top producers and highly recommended. The Irish Vineyard – No Kidding! Many of you, especially the Cork contingent, will be familiar with the Blarney Blonde, an ale by the Franciscan Well. But how many of you about the Blarney Red, the Blarney White, the Kilkenny Red and the Kilkenny White not to mention Pog mo Thoin. Not beers but wines and they are produced in California by Irish Vineyards www.IrishVineyards.com. Could hardly believe it when I stumbled on the site. Apparently it, the vineyard, was set up by the Murphy boys in 1849. Nowadays it is owned by Russell and Joan Irish and you’ll find them in Vallecito, California! 1 Donal Riordan Ballyvolane Cork City. 6 Sean Hegarty Blackrock, Cork. 8 Ann Bevan, Commons Road, Cork. Roz comes up with a top mince pie! 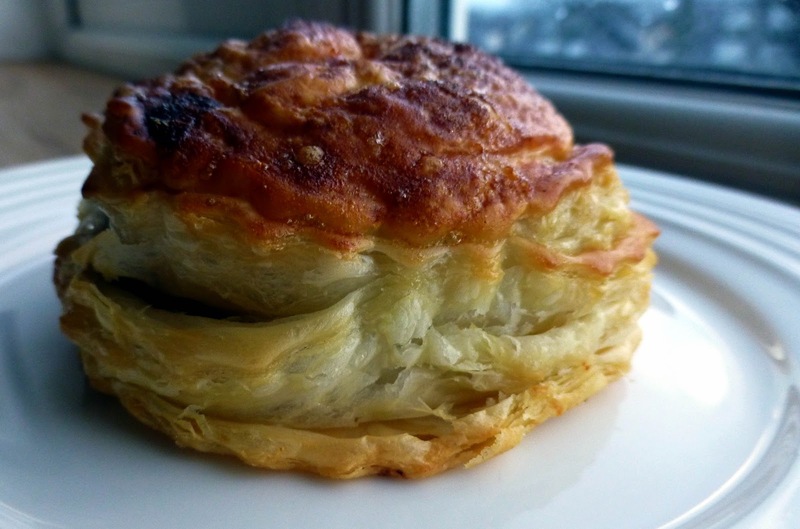 The Irish Examiner's Roz Crowley complied her list of top mince pies about ten days ago and there were no less than three joint winners: Diva Ballinspittle, Heaven’s Cakes and Noreen’s Home Produce. Each scored nine out of ten. Roz herself though has come up with a terrific Mince Pie and I reckon it would give any of the winners a run. Ace Examiner photographer Dan Linehan caught it all on video and you can see it here, along with the details of the competition winners. I retweeted the video and soon Roz issued a challenge to me to make them! Well, it took a while but, with a with a little (considerable!) help from the Chef de Cuisine here, the job was done. And the mix of puff pastry, mince and feta cheese proved irresistible. A great taste with the feta adding a nice piquancy to the overall experience. So why don't you take up the Crowley challenge? 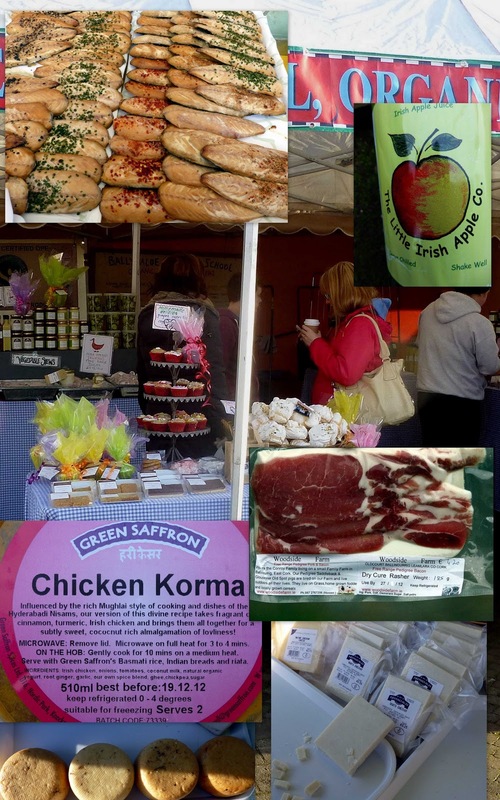 Midleton is the original farmers market and is still well worth a visit every Saturday. Perhaps even more so now with Christmas on the horizon as festival extras are on tempting display. No shortage of music and fun last Saturday as I made a fairly quick visit that started with a cheery mulled wine from the Green Saffron stall and finished with a relaxing high quality coffee in Sage Restaurant, just a few yards from the busy market. 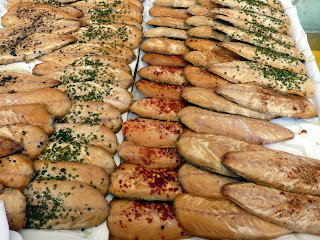 There was an amazing amount of tempting smoked delicacies on the Frank Hederman stand. Lots of mackerel here with different flavourings and I picked the piri-piri and the chive. Spotted a very good deal in apple juice with the Little Irish Apple Company selling five big bottles for a tenner. Heavy going but worth it! Jane Hegarty was on duty as always at her Ardsallagh cheese stall. The hard goat cheese caught my eye and I bought a chunk of the mature one. She also had goat cheddar and cow cheddar for sale. Noreen Conroy, looking forward to the Christmas break, was busy at the Woodside Farm stall while husband Martin was on duty in Douglas. The Woodside hams are flying these days though, on this occasion, we settled for a chat and their tasty sausages and rashers. The question of dinner had been settled in favour of a Green Saffron meal deal and here we got a pot of Chicken Korma, top notch basmati rice and naan bread for just €8.50. We were already well stocked with bread so gave Arbutus a skip on this occasion and the same applied to a few others. Besides, the three bags were fairly full and weighing me down. Time for that coffee and the short trip back to the city! Listen up folks! 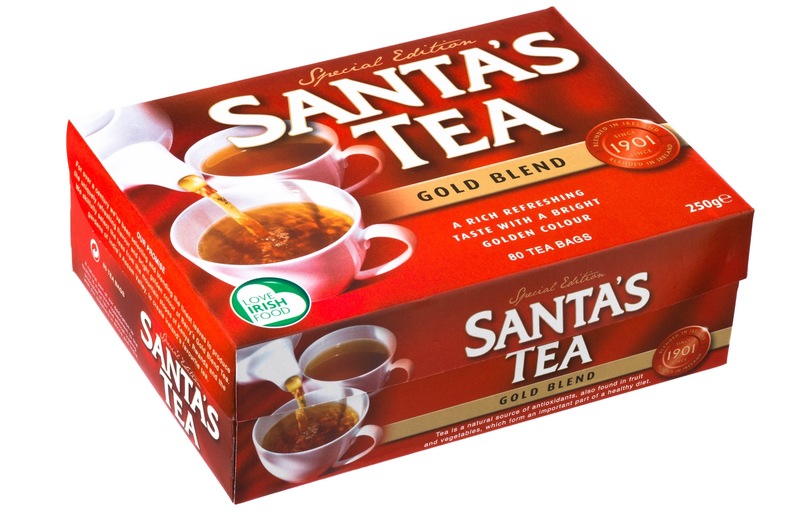 Thanks to Barry's Tea, we've a big bunch of boxes of Santa's Tea as a gift for you! But you gotta be quick - closing date is Sunday next at noon. Send me an email here with the words Yes Please Santa in the subject line. Don't forget your name and address! (RoI addresses only). Staff of Neville Jewellers are all set to cook and serve Christmas Dinner at Penny Dinners. Almost 150 Christmas dinners will be served at Cork Penny Dinners by the staff and management of Neville Jewellers on Sunday 16th December. A family run business since 1971, John Neville and his team will swap the tools of their trade for kitchen utensils and aprons, and have a fabulous traditional turkey and ham Christmas dinner planned for diners of 4 Little Hanover Street in Cork. “Thankfully Christmas is a busy time for retailers in Cork”, said John Neville, managing director at Neville Jewellers. “Our stores in the shopping centres in Wilton and Blackpool as well as Winthrop Street have been busy, but we really wanted to give something back to those less fortunate during the holiday season”. The team at Neville Jewellers are looking forward to cooking and chatting with the diners and hope to bring some Christmas cheer to a wonderful charity that continues to provide food and support to so many of Cork’s people in need. Donation boxes for Cork Penny Dinners are also in store at Neville Jewellers should shoppers wish to make a contribution to this Cork charity. Caitlin Ruth of Deasy’s Harbour Bar & Restaurant in Clonakilty, who, alongside Bridget Healy will be celebrating their love of, and the glory and beauty of the humble Brussels Sprout – with recipes from the traditional, to crostini toppings and coleslaw, it promises to be a good one! A workshop on Mexican Food Gift Ideas with Lily Ramirez-Foran, the writer behind ‘A Mexican Cook in Ireland’, a food blog where she shares her Mexican family recipes and her adventures in her Dublin kitchen. Lily has been living and cooking in Ireland for over 10 years with her Irish husband and business partner, Alan Foran. Together they run ‘My Mexican Shop.ie’, an online shop with everything you need for an authentic Mexican feast at home. 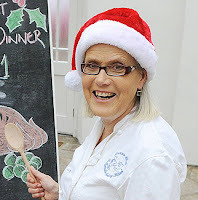 Lily is a member of the Irish Food Bloggers Association and passionately believes in the Slow Food ethos of good, clean and fair food. She works full-time for an Irish not-for-profit organisation and divides her days between her full-time job, the business and cooking and writing for the blog. Busy bee, she usually finds time for a cooking demo or class. Nash 19. Alive with good food and good humour. Alive with good food and good humour. Thought I wouldn’t get a spot at Nash 19 yesterday at lunchtime but there was a table at the back. After a big warm welcome we settled down, our order was taken and we sipped the gorgeous Italian white wine Pecorino. While we were waiting for the mains, we were treated to an Amuse Bouche, chicken liver paté with their own cranberry sauce (when it is as good as this, a little goes a long way). Then down to business, sorry, that should read pleasure. 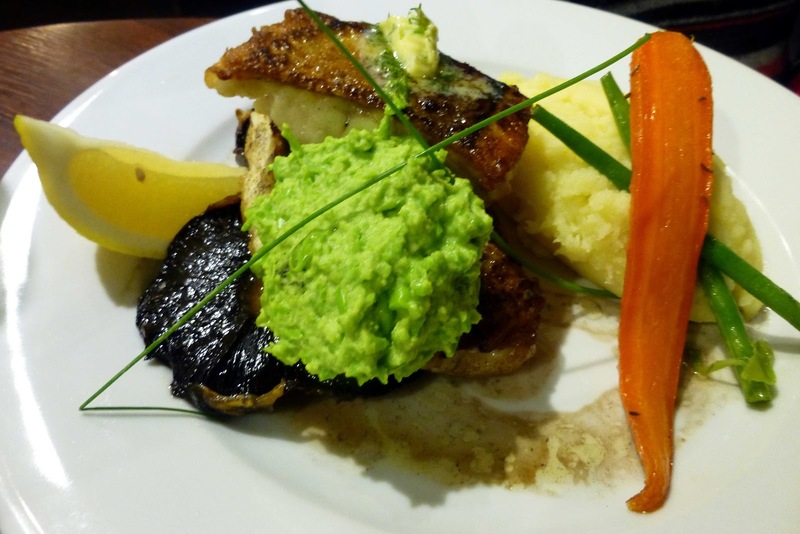 CL picked the O’Connell’s Hake, served with a pea puree and field mushrooms. As usual the fish was fresh, just out of the water you’d think, and cooked to perfection as was everything else on the plate. I choose the Supreme of O’Sullivan’s Chicken with Gubbeen chorizo and spinach. Supreme is the word. Moist and tasty and a spirited reminder every now and then from Fingal Ferguson’s lively chorizo. A vote of confidence in this game is an empty plate and two of them went back to the kitchen. If you are in Nash 19 at this time of the year, you just have to try the Christmas treats. I went for the traditional Mince Pie. Been eating these for over 60 years now and I reckon the Princes Street version is the best ever. Try it for yourself some day. Even if you don’t have time for a meal, just drop in for a pie and a cup of coffee and let me know! CL thoroughly enjoyed her Warm Festive Fruit Tart and I loved my sample but it’s the mince pies for me, though I could me tempted by the Christmas pudding next time. I finished off with a couple of cups of Bewley’s Coffee and headed out in good humour, not just because of the good food but because of the good humour of everyone we met in the restaurant. It is true what they say – it is contagious. Laugh and the world laughs with you. Happy Christmas to all at Nash 19. Making up a meal from your local market is a great idea. It gives your shopping a focus on the day and not alone are you supporting local producers and buying Irish but you are also in for a treat. And these kind of meals don’t have to be that expensive. The basics in this one, from the English Market here in Cork, cost about a fiver a head. Allow about a euro for the liver, 3 euro 50 for the fish and 50 cents for the pear. 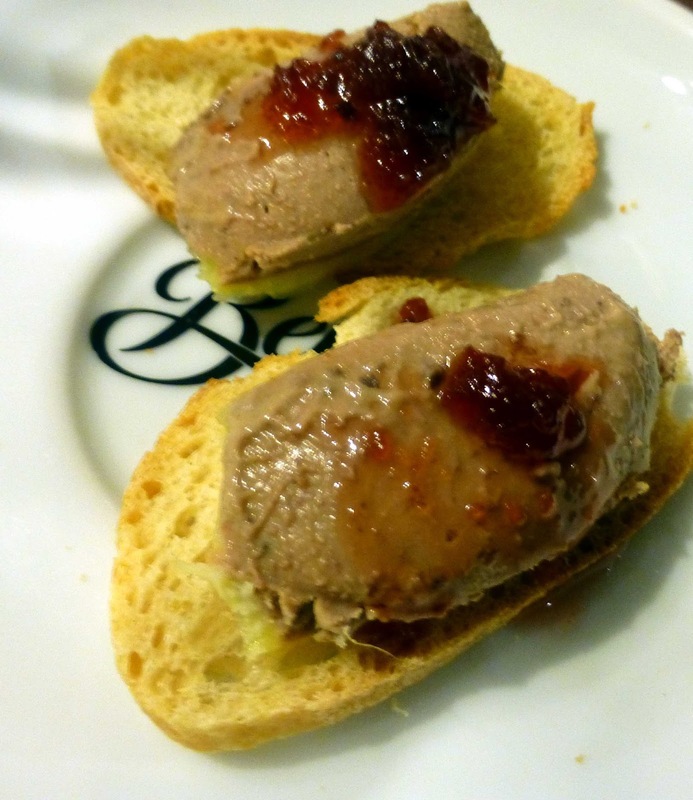 Bought the liver from Eoin O’Mahony and used a recipe called Catalan Style Liver. 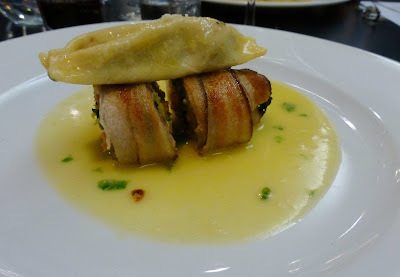 It turned out to be a brilliant dish, a fantastic starter. 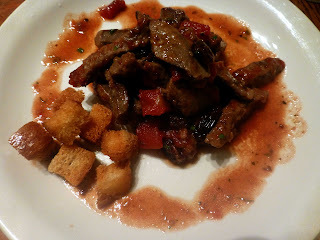 Here the liver is browned and lightly simmered in a well flavoured tomato and raisin sauce with extra flavour coming from a dash of Madeira or Sherry (we used Port) and served with croutons. 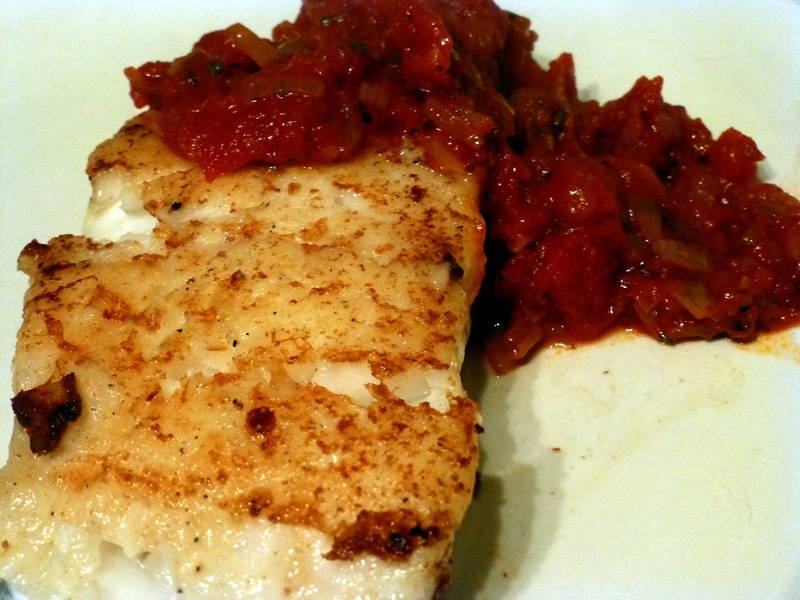 I’ve always thought that Cod and Tomatoes go perfectly well together and that was the case with a French recipe Cabillaud a la Provençal (basically cod with a Tomato and herb sauce). Simply delicious. The pears, bought across the way from O’Mahony’s, were grilled with honey and served with ice cream. Perfect with a shot of Tokaji Aszu. A few minutes around the market and we had the makings of a fabulous meal for ourselves. Now, there was a fair bit of work in the meal above. Even the pears took more work than you’d think. But if you want an easy meal from the market, here is one, constructed from food bought at the Midleton Farmer’s Market. Starter: treat yourself to the fantastic smoked mackerel from the Hederman stand. Pure class. Must be the best around. Mains: Just turn around and go to the Green Saffron stall and pick up one of their meal deals for €8.50. We got enough Chicken Korma, rice and naan bread for two. Easy to prepare and very tasty indeed. 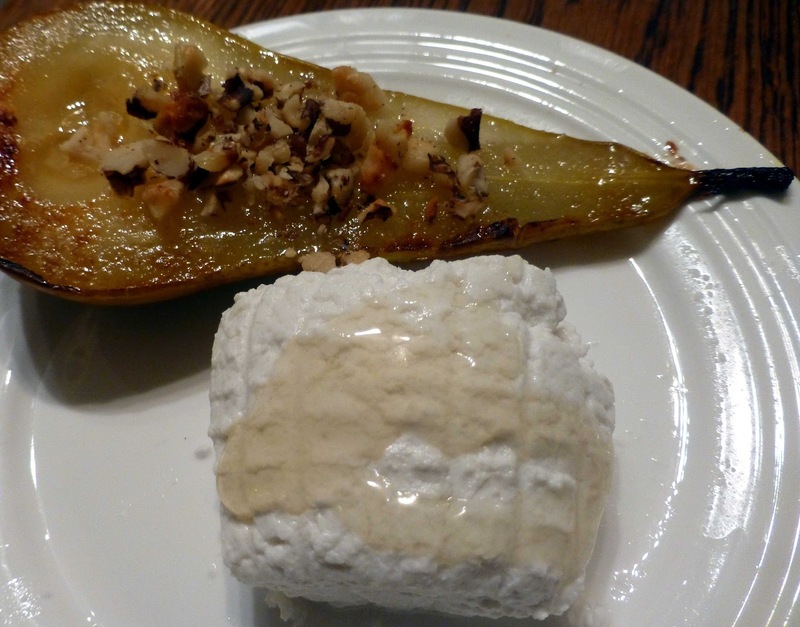 Cheese: Ardsallagh’s hard mature goat cheese with any relish you like. You get quite a chunk of this cheese for about €5.50 and less than half that will do for this course. Love their fresh soft cheese also but the hard (they also have a smoked version) is nice for a change. Cost per head for the basics: €7.50 approx. Just take a look at this remarkable Verdejo. It is beautiful and bright. Already your guard is down. But don't worry, it is a tender trap! Rueda DO is a prestigious white wine region in NW Spain. 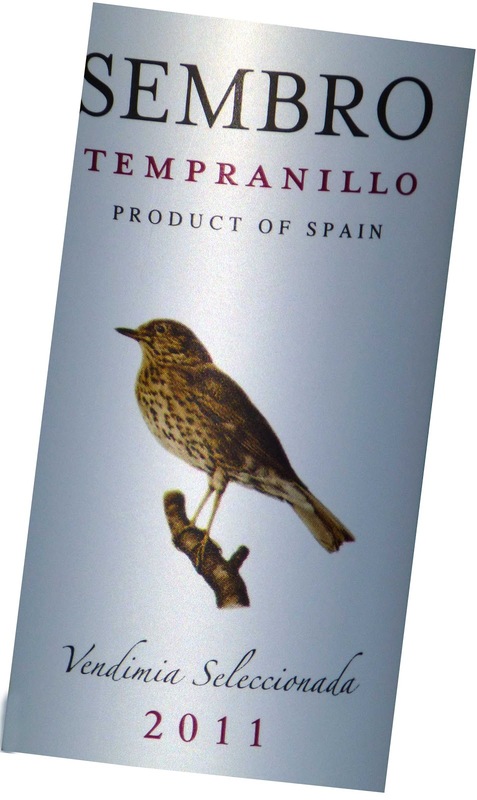 This Orpendola is made with one hundred per cent Verdejo and “tries to express the personality “of the area. Vino Orpendola is a unit of the Osborne family, best known for its sherry. I fell for it at first sight. It has lovely aromas of white fruits and blossom. It is full-textured, fruity, lively and dry. Generous, it doesn’t flatter to deceive and is excellent from start to long finish. Another winner from Wine Alliance. Highly recommended. In singing the praises of a young Spanish wine I must not forget some of the older whites. I had the pleasure of revisiting one this weekend: R. Lopez de Heredia Viña Tondonia, Viña Gravonia Crianza 2002, Rioja DO. Just gorgeous, as I remembered. See the full story here, plus a review of the even better 1996, both white and dry, both memorable. Not only are shoppers at Wilton Shopping Centre enjoying live carol singing and piano playing, as well as great value shopping, but next week they will also be treated to a free Christmas cookery demonstration with celebrity chef and author, Rachel Allen. Shoppers will be shown how to create simple but delicious festive treats and Christmas party food by Rachel Allen, who will be in Wilton Shopping Centre on on Friday, 14 December at 11 am. The demonstration is free to attend and all are welcome. The free Christmas cookery demonstration is the latest in the Wilton Shopping Centre line up this holiday season, which has seen local schools carol singing as well as stunning Christmas piano tunes from Jeffers Pianos on site. Santa is in his grotto at Wilton every day checking his list, reading the Santa letters posted in store, and hearing whether the children of Cork have been naughty or nice. The team at Wilton Shopping Centre are also providing a free gift wrapping service. And of course, Home & Away star, Brax, will be visiting on New Year’s Eve. Boasting 62 shops under one roof, Christmas at Wilton is truly a unique shopping experience in Cork. From the welcoming scents of cinnamon and orange to the friendly service and great choice of Christmas gifts available, Wilton Shopping Centre won’t disappoint. Opening hours have been extended throughout December, and the Wilton Shopping Centre will be open from 9am to 9pm Monday to Friday, 9am to 6pm on Saturdays and Sundays opening hours run from 11am to 6pm. For more information, see www.wiltonshoppingcentre.ie or follow Wilton Shopping Centre on Facebook. This entertaining & educational wine evening will run like a dinner party, starting with wines for the Aperitif, moving on to the Main Event and finishing with the End of the Day. Presenting the evening, with wines to taste, are Colm McCan, Sommelier at Ballymaloe House & Wine Teacher at Ballymaloe Cookery School, together with Peter Corr of Febvre & Co Wine Merchants who is also a guest wine teacher at Ballymaloe Cookery School, both of whom have a combined 50 years experience in the wine world, making them the ideal guides to Festive Wines. Amaze yourself, your family and your friends with your wine knowledge, food & wine pairing, hot tips and wine gift ideas, all with Christmas and the Festive Season in mind. €8 (Slow Food members €5). All are welcome. Advance booking essential. Theatre of Food is ‘popping up’ at Cork Christmas Market this year to bring some top tips for festive fare and seasonal treats. The stage, equipped with a Bosch kitchen will host fantastic participants including some of Cork’s finest chefs: Multi-award winning chef Brendan Cashman, formerly of the Michelin Star-ranked Augustine’s Restaurant; and Kevin Ahern of Sage Restaurant in Midleton, whose restaurant's ethos is to source the best of local produce from Cork County – East, West & North, with most sourced within a 12 mile radius of Midleton. Both will be kicking off the pop up Theatre of Food this Sunday, taking centre stage between 3pm and 6pm, and treating the audience to some seasonal flavours and foods from the English Market. Chef Brendan Cashman brought his cooking magic to CIT this week. Turkey, Smoked Salmon, Pan Roast Squab Pigeon and a dark Chocolate Cake were all on the list but it was brining that caught the attention of the audience. 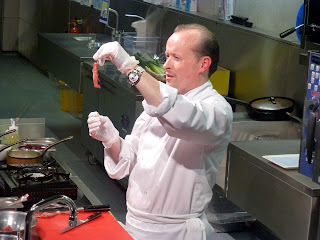 Brendan, giving his services free for this charity event (in aid of St Vincent de Paul), started the evening with a demo of his Alternative to Smoked Salmon. The cure here consisted of lemon zest, dill, coarse sea salt, castor sugar and peppercorns. Samples were soon passed a round amid hums of approval. The main practical demo had Brendan showing us how to cook his Pan Roast Squab Pigeon and Confit leg. The crown had been placed in brine for four hours. But before the pigeon was finished, we had a break, enjoyed some sweet delights produced by the CIT students. that he transformed into a tasty "lollipop"
Bringing was one of preserving options used before the refrigerator and is now making a huge comeback in modern cuisine, particularly in Scandinavia, and is an everyday approach to flavour enhancement in Michelin starred kitchens all over the world. All attendees received a bunch of recipes, along with detailed instructions on curing, smoking and brining. Brining was again the main topic in the closing question and answer session. At the very end, we had the results of the raffle for St Vincent de Paul and glad to say I was among the many winners of Christmas goodies. Great cause and a great demo. Well done to CIT’s Tourism and Hospitality Department and to Dr. Margaret Linehan, the Head of School of Humanities, and her staff, who organised the event. Brendan is officially starting his cookery school in Douglas in the New Year but there are a couple of opportunities to enhance your Christmas cooking skills before then as he has two two-night courses taking place on the 10th and 17th and also on the 11th and 18th of December. For bookings contact him at brendancashman12@gmail.com or telephone 021-4365083. 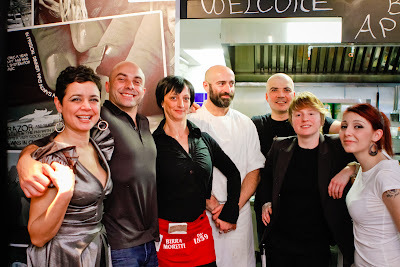 Happy First Anniversary to L’Atitude, the wine cafe at number one Union Quay. Best known for its huge range of wine, available by the tasting glass, by the normal glass, by the carafe and by the bottle, the friendly venue also does morning coffees and gorgeous pastries, light lunches and light meals later on. Beer drinkers are not forgotten either. And, if you like a little music or art, then that’s another reason to make a visit. Wine tastings, even wine classes, are regularly available here. Tuesday was the official anniversary. I couldn’t make that evening’s party but did call in earlier for lunch. They do one soup, one hot dish and a few open sandwiches, all a cut above the average and all priced below the average. Yesterday’s selection: Porchetta and sundried tomato; Fennel salami and gherkin; Buffalo mozzarella with aubergines. Potato and Leek soup can sometimes be bland but not here and you get a massive bowlful and great bread for €4.50. 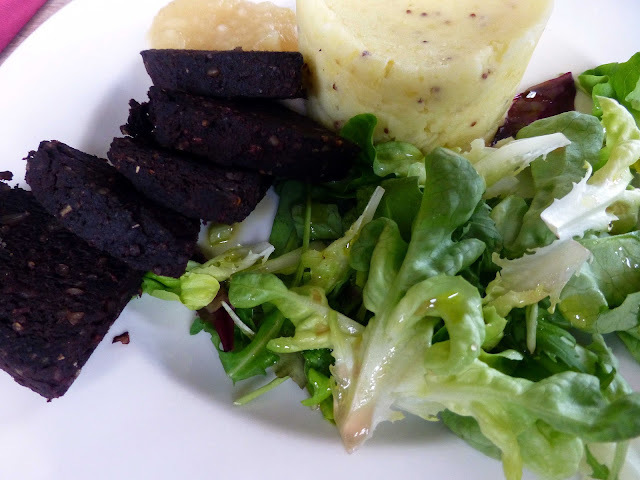 My main course was the Jack McCarthy Black Pudding with Apple Sauce and a Mustard Mash. The cost? Just €6.50. Good food, good value. Ballymaloe’s Colm McCan has been in touch: “We are opening a ‘Pop-Up Christmas Wine Shop’ at Ballymaloe House, each weekend in the run up to Christmas, on Saturdays & Sundays, from 11.00am - 4.00pm. 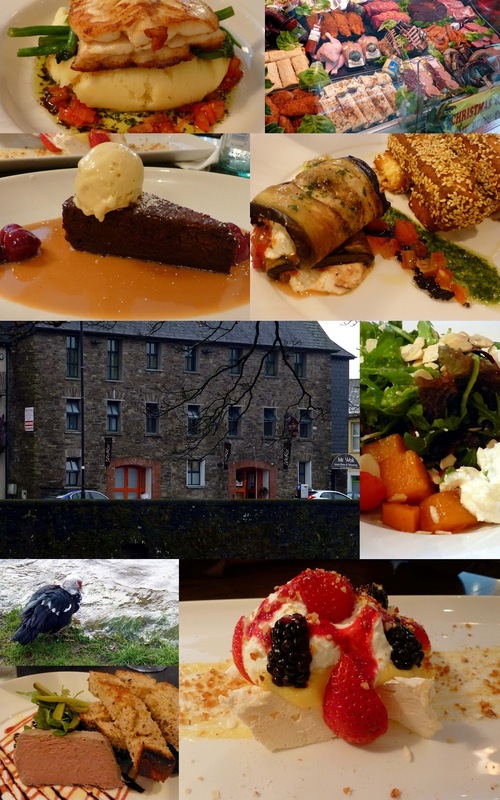 Lots to see & do, and shop, in the area, including Ballymaloe House Shop, celebrating 40 years this year, and the Ballymaloe Shop Cafe for delicious morning coffee, light lunches, and afternoon tea; Ballymaloe House for lunch & dinner, and vouchers for Christmas, and the Farm Shop at Ballymaloe Cookery School. Brunch may have been around for decades but Fenn’s Quay Restaurant, located on Sheares Street in Cork City Centre, is bringing it to Sundays on the 9th, 16th and 23rd of December, from 11:00 a.m. until 4:00 p.m.
Executive Chefess Kate Lawlor has created a delectable brunch menu featuring local ingredients in classics, like Eggs Benedict with Rosscarbery Rashers or Boiled Eggs and Soldiers with Marmite, and indulgent favourites, like fluffy Feirm Úr Buttermilk Pancakes with your choice of crème fraîche, homemade jam or maple syrup. For light eaters, there are Croissants or Fruit Scones served with Irish butter and Kate’s own house-made jam. With a variety of brunch dishes on the special menu, you’ll be spoilt for choice. 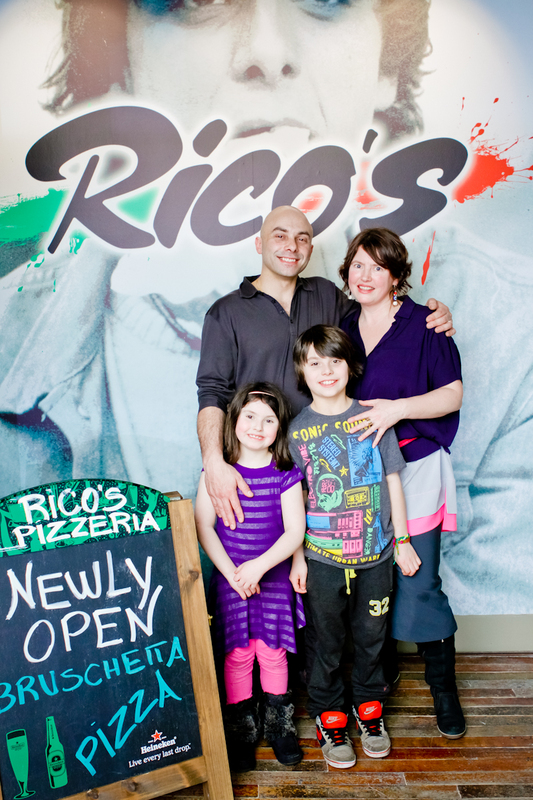 Known for its family-friendly menu and staff, even the littlest brunchers will enjoy themselves. St Tola Ash Log won Best Irish Cheese at the World Cheese Awards! Mature log wins Bronze too. What a great end to 2012! Love your food? Love Your Fun? Love your food? Love Your Fun? 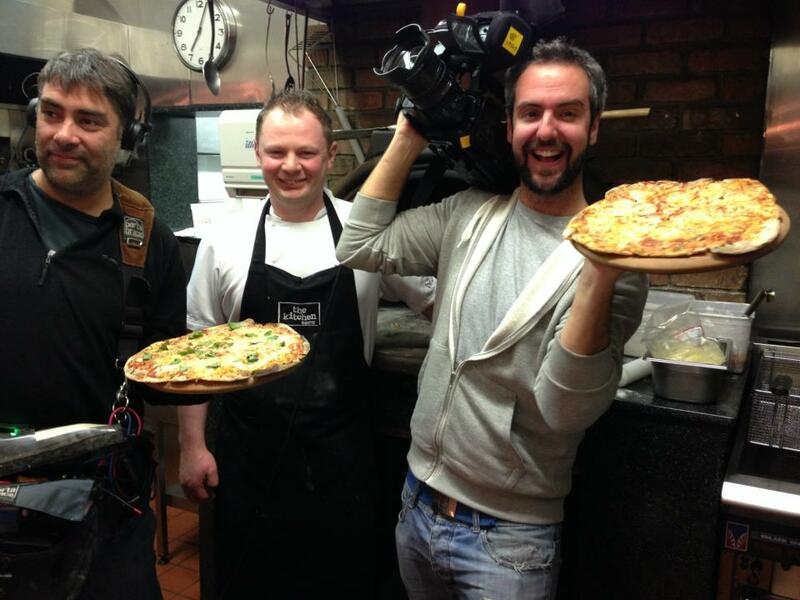 Read on..
"Six In The City" is RTÉ's newest reality entertainment series. Based on the success of a pilot episode, which aired during RTÉ's "Format Farm" season this autumn, "Six In The City" will return to RTÉ 2 this March for a full series of 6 episodes. “ The most successful pair in hosting a great night out, as voted for by the others taking part, will win a €1,000 city break to the European destination of their choice. Do you & your better half have a fantastic social life? How About Showing The Rest Of Ireland How It's Done? RTÉ Two's hit reality show, Six In The City, is back in March, and we'd love YOU and your partner to be the stars. 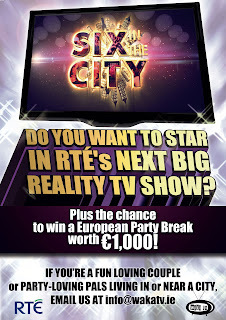 We're looking for party-loving couples from all across Ireland to compete in an exciting city vs city challenge. You'll host YOUR perfect Night Out in YOUR City, and you'll also enjoy a weekend party break in two other Irish cities - all expenses covered. Three couples, three cities and three great nights out. The couple judged to host the best night out wins the €1,000 prize. That could be YOU! YOU'RE AGED OVER 21 - NO UPPER AGE LIMIT. YOU'RE INTERESTED IN - POSSIBLY MUSIC/ FOOD / DANCING / CINEMA /COMEDY/ FINE DINING / AND EVERY SHADE OF PARTY PURSUIT IN BETWEEN. YOU LOVE GOING OUT IN YOUR CITY & YOU'RE DYING TO SHOW THE WORLD WHAT MAKES IT GREAT. The weekend provided the opportunity to try out a pair of reds from Spain and it was time well spent with a stellar duo, each well priced. Both were really good, though the Sembro perhaps had the edge. The vineyard says tradition is respected but “our young team of winemakers are open to innovation and advances, in search of ways of raising qualities”. Reckon they got it spot-on with this warm and spicy 100 per cent Syrah. Nose is complex, fairly intense, dark fruits, especially plum. Plum and cherry on the palate, it is full bodied, smooth and well balanced, moderately spicy with a good long finish. Good value and highly recommended. This is another of the three Osborne family wines recently imported by Wine Alliance. Osborne, well known for its sherries, have several estates in quality DOs in Spain and the philosophy is to ensure the wine “is a unique reflection of the personality of the vineyard”. This very dark red has an intense mix of fruits on the nose. Fruits and some spice on the palate with a pretty smooth mouthfeel and then a good long flavoursome finish. This one has a lot going for it. Quite a personality and highly recommended. From Revenge of the Mooncake Vixen by Marilyn Chin. Last weekend was the first time that Toons Bridge Cafe was selling buffalo meat. Called there Saturday morning and it was great to meet up with owners Toby Simmonds and Jenny-Rose Clarke and also with buffalo farmer Johnny Lynch. There was quite a selection of the meat and, don’t worry, the cafe/shop will be open from 11.00am every Friday, Saturday and Sunday. By the way, they sell much more than meat. There are some great cheeses on displays, especially the mozzarella and ricotta. 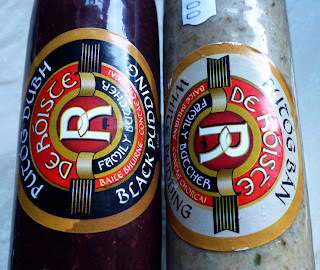 They also do local produce and we helped ourselves to some of De Roiste’s black and white pudding. Don’t forget that they also have a great selection of Mediterranean products, much the same as you see on their olive stalls at the markets, including the English Market. And if you have time to pause and sip, there is the lovely little cafe. The Mozzarella came in a plastic bag with its fluid, “the only way to sell Mozzarella” said Toby. We enjoyed that in the classic manner (below), with tomatoes and basil. 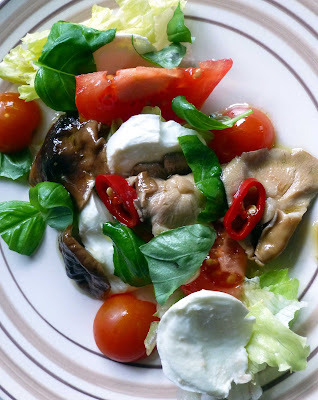 The following day, the “leftovers” were put to good use, mixed with some marinated Shiitake Mushrooms (from Ballyhoura Mushrooms) and a little salad. The mushrooms added another dimension and we had an enjoyable mix on the plate. Two fillets were next up and they quickly cooked and were served with pommes boulangères and some greens, not forgetting a lovely Spanish red. Perfect. Next day, we tried the round roast, cooking it slow and low as advised. Very little fat here so the meat could dry out quickly on a higher heat. Served it with roast spuds and parsnips. Very enjoyable. 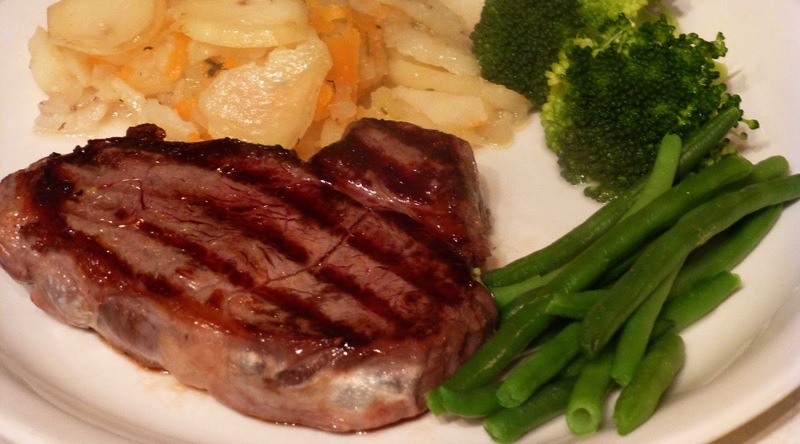 Aside from buffalo meat having 90% less fat, 67% less cholesterol and 45% fewer calories, the opinion here is that, taste wise, the buffalo meat is not that far away from the more usual beef. After all, Le Buff and Le Bouef are closely related. No doubt, the traditional steak accompaniments, such as onions and mushrooms should also go well with the Toons Bridge newcomers. The ricotta can be quite versatile but this time we stuck with it as a dessert, copying the lads in the Mills by drizzling it with a local honey and it worked fine. 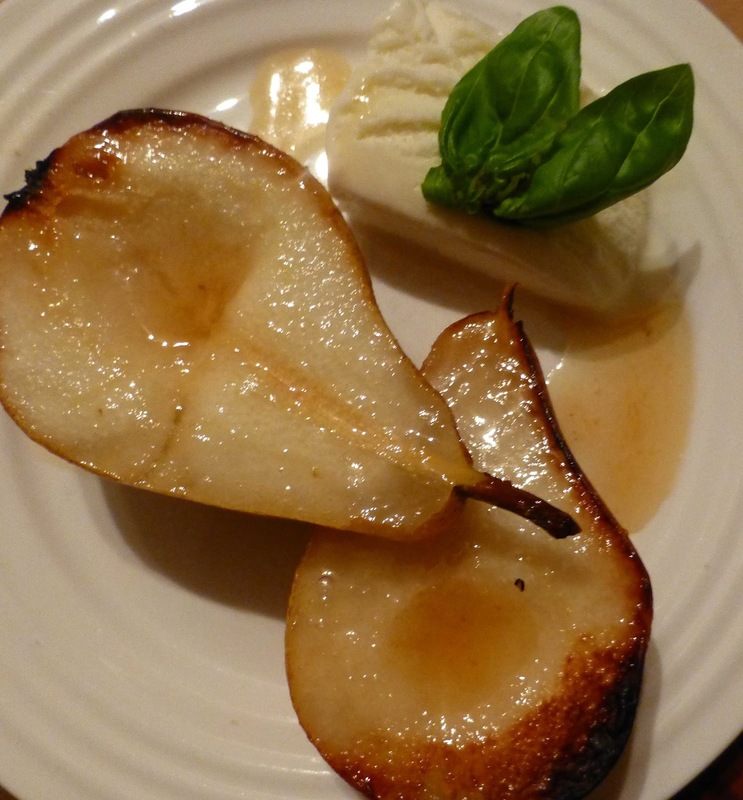 Also had some grilled pears with toasted walnuts on hand but this was really a second dessert rather than a match. Also got a tip from Karen on twitter to try spinach & ricotta cannelloni. Next time! There are many ways of using all these fantastic buffalo products from Toons Bridge – indeed they had a recipe for Pot Roast with Red Wine available last Saturday. So why not try it and get yourself down to the lovely cafe before meat stocks run out! They called it the Rebel Fusion Menu and Fresco Bistro made sure it lived up to its name. Based on the best of Irish ingredients, Chef Kash and his crew came up with a stunning series of dishes, some with a European influence, others with an Asian touch, all delicious and illustrating how the food revolution, inspired by our immigrants, has changed the plates of Cork. And to cap it all, the wine pairings by the experts at L’Atitude 51 were spot-on, with wines from California, Australia and Europe. 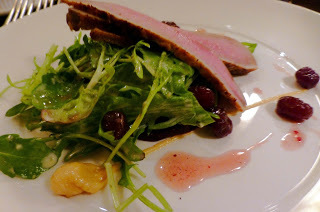 Must say too that the service here was excellent, the staff friendly and well informed on the dishes and the wines. If pushed, I might say that the Brisket Tart and Sausage was my favourite course of the seven but, if pushed another way, I might go for that opening Cappuccino or indeed any course at all. Think I’ll just let the pictures do the talking here. Oh, by the way, it looks as if Fresco Bistro, so hugely encouraged by the response to the venture, will be doing something similar on a regular basis. So, watch this space. A Cappuccino with a difference using Ummera Smoked Salmon and Ballyhoura Shiitake mushroom served with pistachio biscotti. 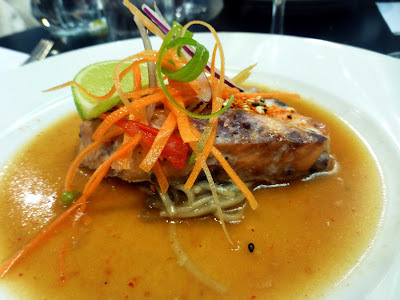 "A brilliant blend, the salmon shining through." The Wine: 2010 Clay Station (California) Viognier. Criostoir's Rebel County Spiced Beef. Spiced beef bon bon pasta accompanied with smoked bacon, cabbage roll and horseradish beurre blanc. "A new way with spiced beef! And that cabbage roll was gorgeous." 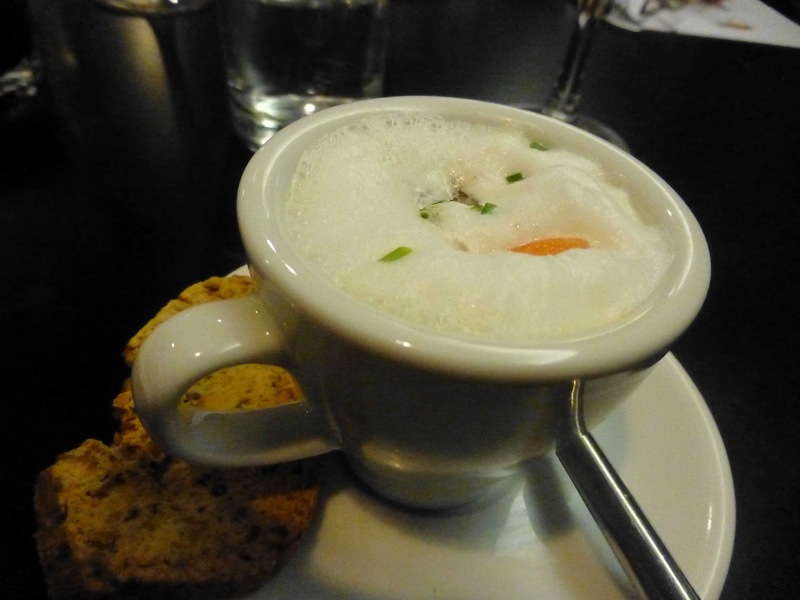 O'Crualaoi's Beef and Ginseng Consomme. Beef consomee topped with goji berries, venison wanton and quail eggs. "Loved those little berries, the eggs, the venison, everything." The Wine: 2008 Cat Amongst the Pigeons (Australia) Cabernet Sauvignon. Mixed berry teriyaki of salmon on sobi noodles and a red miso brother, topped with shichimi togarashi. 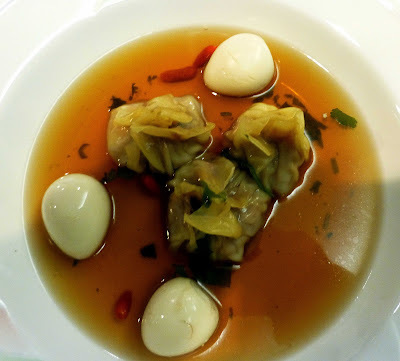 "A brilliant super tasty dish influenced by the land of the rising sun." Pan-fried jumbo prawns with an Asian Salad tossed in a soy, garlic and thyme dressing with an Agar Basil Jelly. 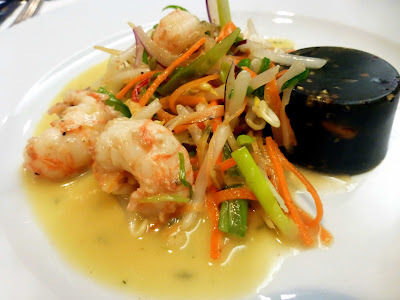 "The prawns were brilliant here and that salad was special. The black cylinder is the Agar. Wasn't too popular!" The Wine: 2008 Rosso di Montalcino (Italy) Sangiovese. Criostoir's Brisket Tart and Murphy's Beef Sausages. A tender brisket filled with quail's eggs in a tart, baked to perfection and accompanied with homemade Murphy's beef sausage. "Yet another top notch dish. 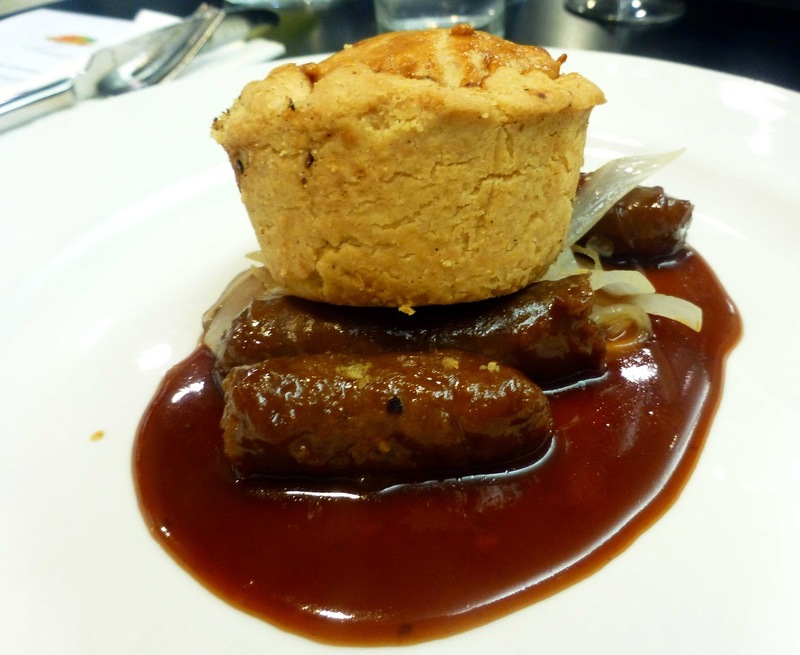 The pie was irresistible; terrific sausage and jus." The Wine: 2008 Chateau Ventenac Reserve (France) Cab Sauv, Merlot and Syrah. An Asian glutinous rice dessert with berries, served with egg and coconut jam, flavoured with screwpine leaf. 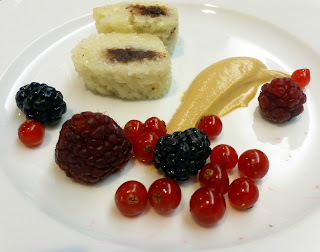 "Wasn't too sure about the rice when I saw this but it was fine with the berries providing a lovely contrast. That jam was yet another treat." The Wine: Franciacorta Brut (Italy) Chardonnay and Pinot Nero.